NASA studies recently have indicated that the Fertile Crescent region in the Middle East is losing fresh water at a rapid rate. The water flow in the important Euphrates and Tigris Rivers has decreased as a result of this trend and formerly arable land in the area has become cracked and dry. The Tigris and Euphrates Rivers are drying up, and these are the very rivers that were once a critical part of the Cradle of Civilization in ancient Mesopotamia 2000 years before Christ. The decrease in water primarily has resulted from a major drought in 2007 and the loss of snow pack in the mountains to the north. 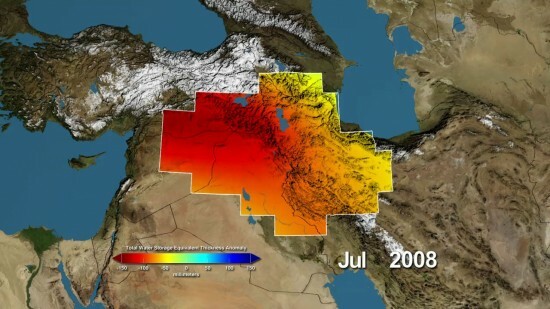 The image map from NASA’s Goddard Space Flight Center and the National Center for Atmospheric Research shows the vast decrease in fresh water in 2008, which continues today. This loss has occurred over the last decade and amounts to over 144 cubic kilometers of water lost from these ancient river basins, which include vast areas in Turkey, Syria, Iraq, and Iran. During the coming battles of World War III, just before the attack of China and the other countries to the east upon Israel, the Euphrates River will be removed as being an obstacle by being dried up. This will permit the march of a 200,000,000-man army to reach the Valley of Jehoshaphat (Armageddon) just as Christ returns to fight against them (Rev. 9:16). Could the current trend toward drought in this region and the dramatic decrease in the Tigris and Euphrates Rivers in recent years be the first stage of the fulfillment of this prophecy? It appears that this is only another important indication of how close we are to the Second Coming! Well ok.....I was looking for this event for the last forty years. I always thought that China would either dam the rivers or divert them so they could march their troops into Israel...Not that they would have succeeded. Thank you Char for this article and website. I pray I am ready for his return! I am editing this because I replied to Bendito accidentally.